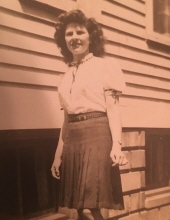 Shirley Bernice (Berry) Hewelt- Lamb, born on April 1, 1926 in Detroit, Michigan, passed away at age 92 on January 31, 2019 in Highland Township, Michigan. She was the beloved wife of the late Robert Hewelt; former wife of the late Milton "Wally" Lamb. She was preceded in death by her grandchild, Jacob Miller. Shirley is survived by her son, Barry Hewelt; daughters, Rebecca (Leslie) Seltz and Heidi Bey; grandchildren, Jason Seltz, Tassie (Thomas) Ogryzek, Joshua Seltz and Olivia Duby; great-grandchildren, Alex, Sam, Carmen, Noah, and Juniper. A celebration of life will be private. "Email Address" would like to share the life celebration of Shirley Hewelt. Click on the "link" to go to share a favorite memory or leave a condolence message for the family.